In two experiments, we investigated whether body posture influences people’s estimation of quantities. According to the mental-number-line theory, people mentally represent numbers along a line with smaller numbers on the left and larger numbers on the right. We hypothesized that surreptitiously making people lean to the right or to the left would affect their quantitative estimates. Participants answered estimation questions while standing on a Wii Balance Board. Posture was manipulated within subjects so that participants answered some questions while they leaned slightly to the left, some questions while they leaned slightly to the right, and some questions while they stood upright. Crucially, participants were not aware of this manipulation. Estimates were significantly smaller when participants leaned to the left than when they leaned to the right. Standard economic and evolutionary models assume that humans are fundamentally selfish. On this view, any acts of prosociality—such as cooperation, giving, and other forms of altruism—result from covert attempts to avoid social injunctions against selfishness. However, even in the absence of social pressure, individuals routinely forego personal gain to share resources with others. Such anomalous giving cannot be accounted for by standard models of social behavior. Recent observations have suggested that, instead, prosocial behavior may reflect an intrinsic value placed on social ideals such as equity and charity. 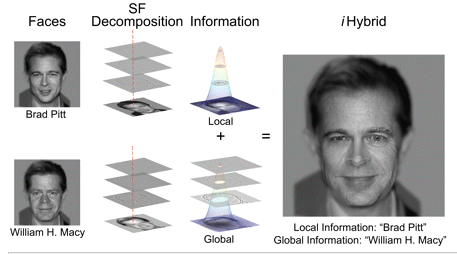 Here, we show that, consistent with this alternative account, making equitable interpersonal decisions engaged neural structures involved in computing subjective value, even when doing so required foregoing material resources. By contrast, making inequitable decisions produced activity in the anterior insula, a region linked to the experience of subjective disutility. Moreover, inequity-related insula response predicted individuals’ unwillingness to make inequitable choices. Together, these data suggest that prosocial behavior is not simply a response to external pressure, but instead represents an intrinsic, and intrinsically social, class of reward. Researchers have theorized that innate personal traits are related to leadership success. Although links between psychological characteristics and leadership success have been well established, research has yet to identify any objective physical traits of leaders that predict organizational performance. In the research reported here, we identified leaders’ facial structure as a specific physical trait that correlates with organizational performance. Specifically, we found that firms whose male CEOs have wider faces (relative to facial height) achieve superior financial performance. Decision-making dynamics within a firm’s leadership team moderate this effect, such that the relationship between a given CEO’s facial measurements and his firm’s financial performance is stronger in firms with cognitively simple leadership teams. Figure - Industry-adjusted return on assets (ROA) as a function of the cognitive complexity of firms’ top management teams (TMTs) and CEOs’ facial width-to-height ratio (WHR). 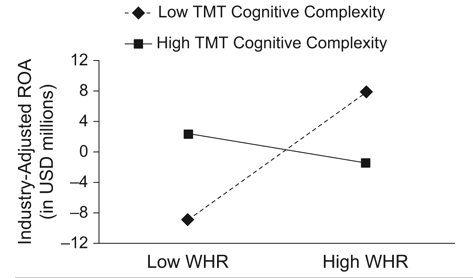 The slopes illustrated in this graph were calculated using the minimum (low) and maximum (high) values for cognitive complexity and CEO facial WHR. USD = U.S. dollars. Our mindreading of another person depends on how much skin we see! Do people’s mental capacities fundamentally change when they remove a sweater? This seems absurd: How could removing a piece of clothing change one’s capacity for acting or feeling? In six studies, however, we show that taking off a sweater—or otherwise revealing flesh—can significantly change the way a mind is perceived. In this article, we suggest that the kind of mind ascribed to another person depends on the relative salience of his or her body—that the perceived capacity for both pain and planned action depends on whether someone wears a sweater or tank-top. According to models of objectification, viewing someone as a body induces de-mentalization, stripping away their psychological traits. Here evidence is presented for an alternative account, where a body focus does not diminish the attribution of all mental capacities but, instead, leads perceivers to infer a different kind of mind. Drawing on the distinction in mind perception between agency and experience, it is found that focusing on someone's body reduces perceptions of agency (self-control and action) but increases perceptions of experience (emotion and sensation). These effects were found in three experiments when comparing targets represented by both revealing versus nonrevealing pictures or by simply directing attention toward physical characteristics. In two further experiments he effect of a body focus on mind perception also influenced moral intuitions, with those represented as a body seen to be less morally responsible (i.e., lesser moral agents) but more sensitive to harm (i.e., greater moral patients). These effects suggest that a body focus does not cause objectification per se but, instead, leads to a redistribution of perceived mind. Whereas altruism drives the evolution of human cooperation, ethno-religious diversity has been considered to obstruct it, leading to poverty, corruption, and war. We argue that current research has failed to properly account for the institutional environment and how it affects the role diversity plays. The emergence of thriving, diverse communities throughout human history suggests that diversity does not always lead to cooperation breakdown. We conducted experiments in Mostar, Bosnia-Herzegovina with Catholic Croats and Muslim Bosniaks at a critical historic moment in the city’s postwar history. Using a public goods game, we found that the ability to sanction is key to achieving cooperation in ethno-religiously diverse groups, but that sanctions succeed only in integrated institutional environments and fail in segregated ones. Hence, we show experimentally for the first time in a real-life setting that institutions of integration can unleash human altruism and restore cooperation in the presence of diversity. Our biological immune system activates our behavioral immune system. Activation of the behavioral immune system has been shown to promote activation of the biological immune system. The current research tested the hypothesis that activation of the biological immune system (as a result of recent illness) promotes activation of the behavioral immune system. Participants who had recently been ill, and had therefore recently experienced activation of their biological immune system, in one study displayed heightened attention to disfigured individuals, and in a second study showed avoidance — cognitive and behavioral processes reflecting activation of the behavioral immune system. These findings shed light on the interactive nature of biological and psychological mechanisms designed to help people overcome the threat of disease. There is a growing recognition of how animals respond to the affective states of other animals, including the show of empathy, a state once thought to be unique to primates...A key question concerns the nature of the rats' motivations—the affective and cognitive underpinnings of their “empathy.” ...Future research needs to untangle whether empathic responses in mammals arise more from higher cognitive or lower affective brain functions, or some combination of these (see the figure). Human brain imaging studies of empathy suggest both are involved, especially in coping with the distress of others. But solid neurobiologically based evolutionary evidence, both bottom-up and top-down, is so far lacking. Figure legend - One concept of how mammalian brains generate empathic responses at different levels is shown. Primary emotional processes, where sources of empathy may arise (i.e., feeling what other organisms are feeling), coordinate with secondary-process learning and memory mechanisms (i.e., knowing what others are feeling). Both of these then interact with higher mental processes, which can exert a variety of top-down influences on the regulation of empathic tendencies (i.e., desires to respond compassionately to others' distress). 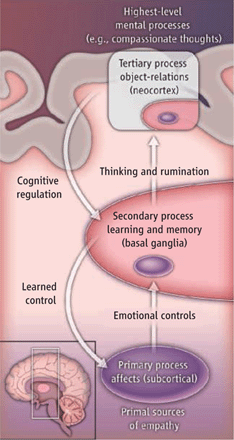 The layering of evolutionary progressions is evident in the human brain. The deepest midbrain and hypothalamic regions mediate primary-process, instinctual affects. More recently evolved subcortical regions, among them basal ganglia, amygdala, and nucleus accumbens, help promote higher cognitive activities through learning and memory. Although we currently look to mirror-neuron zones of the neocortex for evidence of the highest mind functions such as compassion, empathic tendencies are surely also promoted by the more ancient primary-process emotional networks that are essential foundations for mental life. For example, a primal form of “empathy” is mothers' exquisite sensitivity to crying babies. Might crying access those systems in mothers' brains that are known to mediate separation anxiety in young animals? Perhaps affective urges for maternal caregiving are triggered as mothers' brains experience psychological pain engendered by their infants' cries. It may be that empathic coordination of social motivations is mediated by emotional resonances among nearby animals, allowing receivers to experience the emotions of transmitters. At such deep affective levels, emotional states may reverberate among animals, with no need for learned rerepresentations arising from mirror neurons. Mammals may have intrinsic abilities to resonate with the pains and joys of nearby others through primal emotional contagion. Much deep-brain research remains to be done to understand the degree to which mammalian empathy is achieved more through higher social-cognitive processes or primal affective processes in the brain. Simplified models of empathy, as in mice and rats, offer new inroads for understanding our own social-emotional nature and nurture. Such knowledge may eventually help us promote nurturant behaviors in humans. Empathy, a well-known characteristic in humans, occurs when an individual is motivated to help another, while maintaining emotional separation. Thus, it is distinct from emotional contagion where an individual begins to experience the emotions of other individuals, and act similarly. Emotional contagion is known to occur in many mammalian species, but empathy has often been considered unique to primates. Through a controlled experiment in captive rats, Ben-Ami Bartal et al. (p. 1427; see the Perspective by Panksepp) show that the biological roots of empathy could be much deeper than recognized. Rats were highly motivated to release a restrained cagemate, even when they were not permitted any immediate contact with it after release. Furthermore, when presented with chocolate, a highly preferred food, the rats were still motivated to release their cagemate and even shared the food with them. Thus, empathically motivated prosocial behavior is not limited to primates, and—like many other behaviors previously thought to be limited to this group—may serve similarly important functions across species. Two fascinating recent articles deal with the power we seem to have to heal ourselves by believing that a particular faith, meditation, or procedure (like acupuncture or an effective looking sugar pill) will do the job. 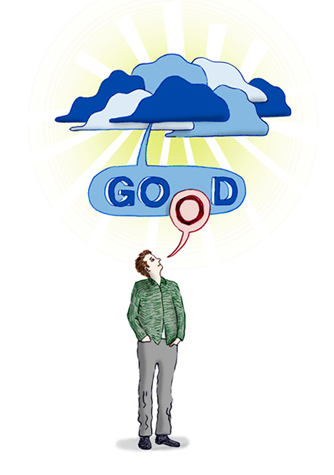 An article by Michael Specter in the Dec. 12 issue of the New Yorker describes the work of Ted Kaptchuk, who is director of the Harvard Program in Placebo Studies and the Therapeutic Encounter. The second article, by Nicholas Humphrey, suggests that the placebo effect is the result of a trick that has been played by human culture, and that is can be generalized to explain how we might also be able to alter our 'self-management systems'. The Specter article gives a nuanced discussion of the complexity and ambiguities of alternative healing treatments. I am amazed that I had not been aware of results of neuroimaging studies that have tracked brain activity in response to either a drug or a placebo as soon as they are taken. One has shown that injection of saline that has been described as a drug can reduce a patient's symptoms of Parkinson's disease and caused in crease in brain dopamine that the disease destroys. A chemical basis of a pain relieving placebo effect was shown in a seminal 1978 experiment in which dental surgery patients who reported their pain was decreased by receiving an injection of saline instead of morphine had Naloxone added to their I.V. drips. Naloxone is a drug developed to counteract overdoses of heroin and morphine by blocking opioid receptors in the central nervous system that are normally acted on by endorphins. Naloxone blocked the placebo pain relief, proving that its chemical basis was most likely due to the actual relief of endorphins in the brain by the power of belief. ...until less than 100 years ago, there was hardly anything a doctor could do that would be effective in any physiological medicinal way—and still the doctor's ministrations often "worked". That's to say, under the influence of what we would today call placebo medicine people came to feel less pain, to experience less fever, their inflammations receded, and so on...I realized it must be the result of a trick that has been played by human culture. The trick isto persuade sick people that they have a "license" to get better, because they'rein the hands of supposed specialists who know what's best for them and can offer practical help and reinforcements. And the reason this works is that it reassures people—subconsciously —that the costs of self-cure will be affordable and that it's safe to let down their guard. So health has improved because of a cultural subterfuge. It's been a pretty remarkable development. To explain placebos I think we need to invoke the existence of an "evolved health management system". The placebo effect is a particular kind of priming effect. And what I want to do now is to explain a whole range of other priming effects by invoking the existence of an "evolved self-management system". It makes sense that our brains should have come to play a crucial part in the top-down management of bodily health. As I see it, what the health management system has evolved to do is to perform a kind of economic analysis of what the opportunities and the costs of cure will be: what resources we've got in reserve, how dangerous the situation is right now, what predictions we can make of what the future holds...So now, where does the placebo effect fit in? Placebos work because they suggest to people that the picture is rosier than it really is. Just like the artificial summer light cycle for the hamster - which causes them to mount a more massive and effective immune response to infection, because it is not as important to conserve resources in the summer as in the winter - placebos give people fake information that it's safe to cure them. Whereupon they do just that. This suggests we should see the placebo effect as part of a much larger picture of homeostasis and bodily self-control. But now I'm ready to expand on this much further still. If this is the way humans and animals manage their physical health, there must surely be a similar story to be told about mental health. And if mental health, then—at least with humans—it should apply to personality and character as well. So I've come round to the idea that humans have in fact evolved a full-blown self management system, with the job of managing all their psychological resources put together, so as to optimise the persona they present to the world...our ancestors already had a template for doing these calculations, namely the pre-existing health system. In fact I believe the self management system evolved on the back of the health system. But this new system goes much further than the older one: it's job is to read the local signs and signs and forecast the psychological weather we are heading into, enabling us to prejudge what we can get away with, what's politic, what's expected of us. Not surprisingly, it's turned out to be a very complex system. That's why psychologists working on priming are discovering so many cues, which are relevant to it. For there are of course so many things that are relevant to managing our personal lives and coming across in the most effective and self-promoting ways we can. Because our circumstances have generally improved in the last ten thousand years, and yet evolutionary catch-up occurs relatively slowly, this means that both systems will have become "out of date" in the way they calculate costs and benefits. At both the health-level and the self-level, there are bound to be things humans could not risk doing in the past that they can risk now. Placebo medication works by tricking the subject with false information into believing the situation warrants a reduction in pain, for example, or the mounting of an expensive immune response. Yet it's precisely because our environment today is less dangerous than it used to be, that responding to this trick no longer puts us at an unacceptable risk...because the same kind of improvement has occurred in our social lives, the same goes for the risks with managing the self. In the "environment of evolutionary adaptiveness"—the social and physical environment, 100,000-10,000 years ago, in which many of our biological adaptations were laid down—our ancestors lived in very small scale societies, where individuals were monitored all the time by the group, and it was essential to conform to others' expectations...We no longer live in such an oppressive environment. We no longer need to play by the old rules, and rein in our peculiar strengths and idiosyncrasies. We can afford to take risks now we couldn't before...I think it really ought to be possible to devise placebo treatments for the self, which do indeed induce them to come out from their protective shells —and so to emerge as happier, nicer, cleverer, more creative people than they would ever otherwise have dared to be. Even the best musicians make slight errors when playing a rhythm. We find this frailty to be appealing, as evidenced by the fact that computer-generated perfect rhythms are often perceived as sterile or artificial. Having known this phenomenon for a long time, software engineers have added slight rhythmic fluctuations to make computer-generated music sound more human. These fluctuations are usually produced by a random number generator. Hennig et al. have now analyzed the statistical properties of music produced by professional musicians. They found that there are long-range fluctuations when humans produce all sorts of rhythms. A small rhythmic fluctuation at some point in time not only influenced fluctuations shortly thereafter, but even after tens of seconds. When given the choice, listeners clearly preferred music produced according to these criteria over the random number-generated fluctuations. The authors conclude that these results may not only have practical implications such as improved techniques for audio editing and humanizing music, but they may also provide new insights into the neurophysiology of time perception and timing of actions. Although human musical performances represent one of the most valuable achievements of mankind, the best musicians perform imperfectly. Musical rhythms are not entirely accurate and thus inevitably deviate from the ideal beat pattern. Nevertheless, computer generated perfect beat patterns are frequently devalued by listeners due to a perceived lack of human touch. Professional audio editing software therefore offers a humanizing feature which artificially generates rhythmic fluctuations. However, the built-in humanizing units are essentially random number generators producing only simple uncorrelated fluctuations. Here, for the first time, we establish long-range fluctuations as an inevitable natural companion of both simple and complex human rhythmic performances. Moreover, we demonstrate that listeners strongly prefer long-range correlated fluctuations in musical rhythms. Thus, the favorable fluctuation type for humanizing interbeat intervals coincides with the one generically inherent in human musical performances. Unrealistic optimism is a pervasive human trait that influences domains ranging from personal relationships to politics and finance. How people maintain unrealistic optimism, despite frequently encountering information that challenges those biased beliefs, is unknown. We examined this question and found a marked asymmetry in belief updating. Participants updated their beliefs more in response to information that was better than expected than to information that was worse. This selectivity was mediated by a relative failure to code for errors that should reduce optimism. Distinct regions of the prefrontal cortex tracked estimation errors when those called for positive update, both in individuals who scored high and low on trait optimism. However, highly optimistic individuals exhibited reduced tracking of estimation errors that called for negative update in right inferior prefrontal gyrus. These findings indicate that optimism is tied to a selective update failure and diminished neural coding of undesirable information regarding the future.